Not everyone is a fan of Christmas, the screaming kids, the ridiculous commercialisation and the in-your-face approach of many advertisers can annoy just as many people as it pleases. Leander games have released the perfect slot for this situation and it is just in time for Christmas. Scrooge’s Jackpot is the ideal pokie for people who get driven up the wall during the holiday season. This pokie features the usual great looking Leander graphics that evoke the computer-animated work of companies like Pixar. The RTP is below overage, listed as just over 94%, but this game has enough features to keep you engaged. 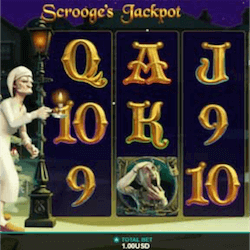 For those unfamiliar with the story, this pokie follows the tale of the old man called Scrooge who despises Christmas. While sleeping on Christmas Eve, Scrooge is visited by three ghosts, the ghosts represent the past, present and future, showing Scrooge where he went wrong and what awaits him in the future if he doesn’t change his negative ways. Players get to join Scrooge on his journey of self-discovery in Scrooge’s Jackpot, and there just may be a progressive jackpot to be won. The reel icons include a candlestick wild symbol and all three ghosts that visit Scrooge at night. This is a great pokie that is perfect for the more cynical pokie players out there who just want a game that can match their mood and get them through the holidays in one piece. This pokies’ progressive jackpot and the variety of features, many triggered randomly, gives it a simple feel which is great for just kicking back and enjoying the spins. The Candle Wilds Feature – When this feature is active, Scrooge will appear on the reels and light up the screen, adding two wild columns to the reels for some big winning potential. Sit Down For A Festive Feast – This feature lets you sit down for a roast turkey dinner, uncovering a variety of bonuses inside the turkey, including up to 45x your total staked wager. The Free Spins Feature – The free spins game awards players with 7 free spins. What really makes this feature rewarding is the fact that the Candle Wilds will be active for every single spin here. The Progressive jackpot – This feature is randomly awarded to a player but the higher the wager you are playing with the better the odds of you winning the jackpot. A fun pokie for the festive season, this game sets the bar high for other Christmas releases.